Avi Vantage integrates with Amazon Web Services (AWS) for providing IPAM services to applications running on instances in AWS. 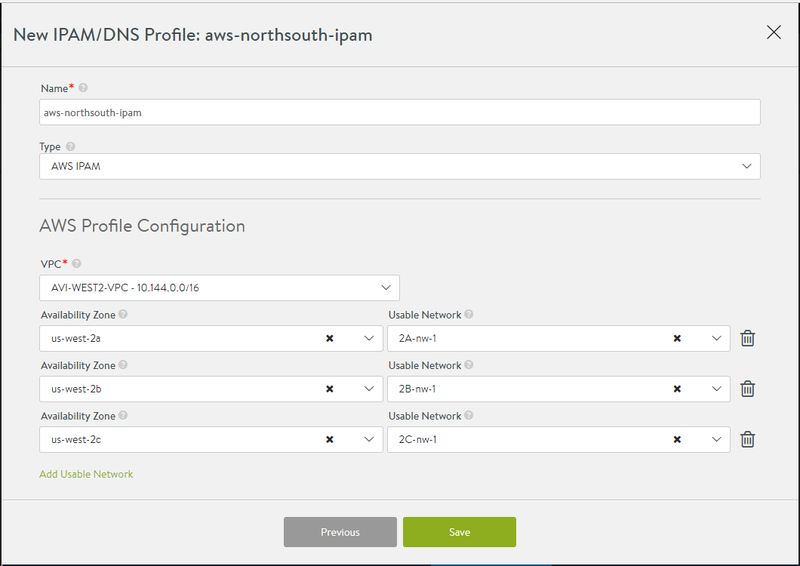 If the Avi Vantage cloud type is AWS, there is support for IPAM, by default, without need for a separate IPAM configuration. A separate IPAM configuration (as described below) is required only for cases where AWS provides the infrastructure service for other clouds (e.g., Mesos Cluster running on AWS instances). Identity and Access Management (IAM) roles: Set of policies that define access to resources within AWS. AWS customer account key: unique authentication key associated with the AWS account. If using the IAM role method to define access for an Avi Vantage installation in AWS, use the steps in this article to set up the IAM roles before beginning deployment of the Avi Controller EC2 instance. 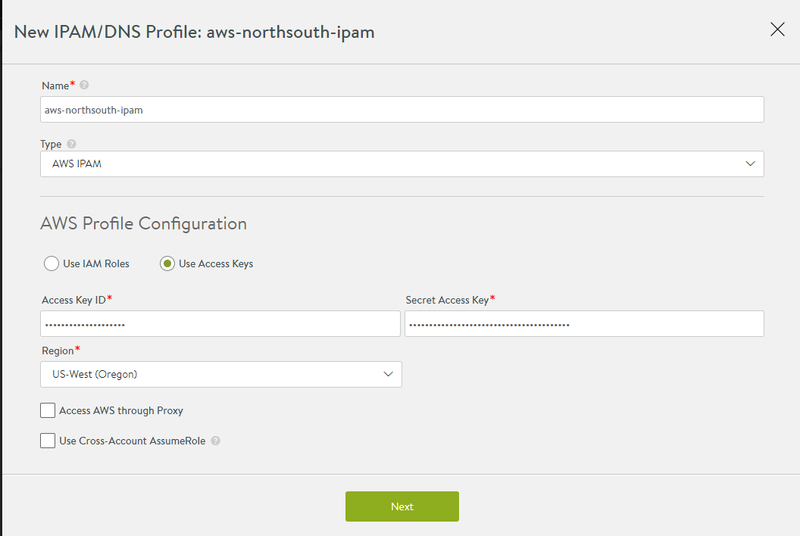 Access Key ID: AWS customer key ID. Secret Access Key: customer key. Select the AWS region into which the VIPs will be deployed. Select “Access AWS through Proxy”, if access to AWS endpoints requires a proxy server. Select “Use Cross-Account AssumeRole”, if the AWS credentials or role is being leveraged to access across accounts. Read AWS Cross-Account AssumeRole Support for details. Step 2. A dropdown of available VPCs in that region is displayed. A dropdown of availability zones (AZ) in that region and a corresponding list of networks in each AZ are displayed. For multi-AZ virtual service applications, configure at least one network from each AZ for IPAM.